Some of my Top 10–the others have been passed along. Top Ten Tuesday is a weekly book blogger’s meme organized by The Broke and The Bookish. This week this topic is the Top Ten Books Read So Far in 2013. Technically I read this late last year, but I just loved it! It’s even better than Wolf Hall. I had to give it a shout-out as I’ve been meaning to blog about Mantel. I have been rereading this in several iterations for the P&P Bicentenary Challenge. I was so excited to also discover a graphic novel version by Marvel. Haruf returns to Holt, Colorado in his spare, inviting prose. This is a truly satisfying sequel to Plainsong, which I loved. I enjoyed but am not gushing over Benediction, his new book which takes place years later with a different cast. This achingly beautiful classic shows the hard life of early settlers in Nebraska. Cather paints a vivid and nostalgic picture of the last days of the red-grass prairies and that immense, untracked emptiness. This is a twisty, pulpy, noir with a devious unreliable narrator. Rindell infuses her tale with the snazzy glamour of 1920’s New York: speakeasies, flappers, and lavish parties in the Hamptons. A fascinating and stirring read. Those who don’t normally read historical non-fiction will be quickly drawn in, and history buffs will find several new aspects to consider. I have long been entranced by the poetic, magical realism spun by Erdrich. This book also pulls readers along with a thread of suspense. This is not my favorite by Erdrich, but a very good book nonetheless. Kanner has given us a sharply drawn work of literary fiction that is also an addictive read. Narrated by Noah’s unnamed wife, this is a bit like Noah’s Ark meets The Red Tent meets the Titanic-in-reverse. I cannot recommend these books enough! Martin has me totally wrapped up in this magical, mysterious realm. Be warned though—this series is unputdownable book crack. Ok, this makes 11, but I am surprised by how much I’m enjoying this! I haven’t read much King and was spurred to pick this up by the #DomeAlong group read. Suspense, psychological intrigue, and loaded with King’s trademark easter eggs. What is the best book you have read so far this year? I’d really appreciate some book recommendations, please. 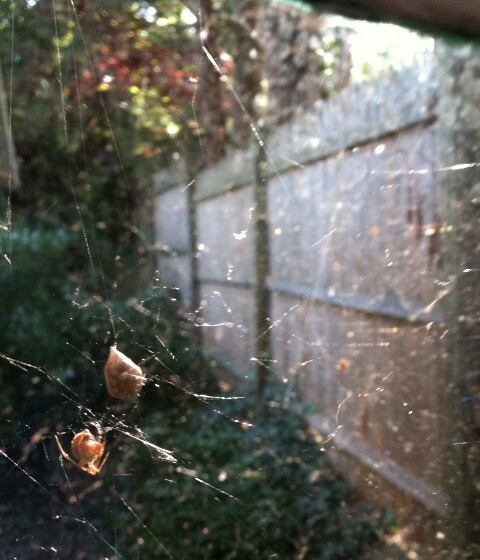 I have a high back window that has played home to a succession of spiders. Jokingly, I have referred to each as Charlotte A. Cavatica, after Wilbur’s friend. Visiting kids always like to climb up and take a look at the arachnid in action—spinning or repairing the web and, yes, sometimes wrapping up struggling prey. It’s a bit like my own personal Nature Channel. Now it turns out, I actually do have a Charlotte out there, complete with a very large egg sac that she is tending. Like most people, I have a natural fear of these eight-legged beasts, but I loved Charlotte’s Web so much (still do), that I cannot bring myself to kill them. I have somewhat perfected the art of spider catch-and-release. Also, I was really moved by Life and Death in Shanghai, Nien Cheng’s wrenching memoir of her persecution during China’s Cultural Revolution. Cheng was imprisoned in solitary confinement for seven years, her only friend a spider in the upper corner of her cell. As she watched the spider swing about creating its intricate web, Cheng wrote, “I knew I had just witnessed something extraordinarily beautiful and uplifting … I felt a renewal of hope and confidence.” With the spider there, she felt less fearful of the guards who bullied her daily. 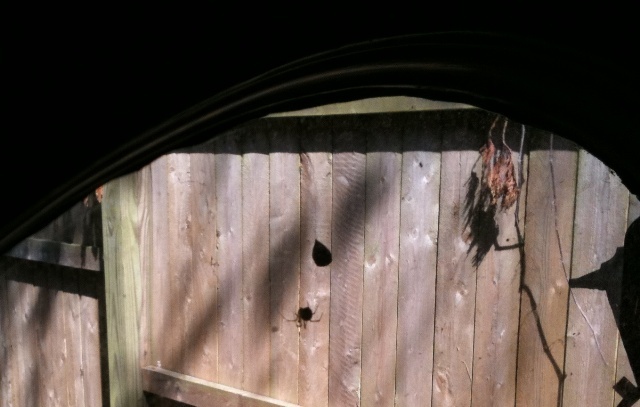 I confess, though, as I look out at the bulging egg sac dangling so close to my window … I am a bit (ok very) freaked. [Click on the pic to really see the eggs.] One day hundreds of spiders will burst out separated only by a pane of glass. I’m terrified of a spider invasion through the cracks of my house. But these two books have left such a mark that I cannot bring myself to sweep it all away. Instead, I’m hoping that like Charlotte’s brood these mini critters will quickly spin tiny balloons and disperse, sailing off with the wind. Perhaps the runt will be left behind to occupy my window, if so I would name her Aranea. I really enjoyed Revolutionary Summer: The Birth of American Independence by Pulitzer Prize winner Joseph J. Ellis. This book offers several fascinating and new (to me) insights on that seminal time frame from May to October of 1776, which Ellis calls “the crescendo moment” in American History. Ellis puts a somewhat sympathetic focus on General William Howe. Ellis explains the thought process behind Howe’s cautious military strategy, particularly his aspirations of diplomacy. Rather than crush the rebellion, Howe wanted to return to Britain having brought the Americans back into the fold. He believed, as did many of his countrymen, that the cry for independence came from a loud minority and not from the general American public. This was reinforced by the welcome he got when he landed on Long Island, then the largest concentration (with New York) of loyalists to the crown. Howe’s strategy was to demonstrate his martial dominance, thus bringing the Americans to their senses, and then negotiate peace with them. He had several opportunities early on to end the war with a decisive blow, but held back. Ellis adds a whole new intrigue to the dance between Howe and Washington, as we see each misinterpreting the other’s motives and moves. Instead, it was the trudging, poorly-rationed regulars of Washington’s Continental Army, who fought the hardest and who kept up the battle, which became a drawn-out war of attrition. The states preferred to outfit their own militias, or Minutemen, rather than supply a unified army. This was partially due to regional loyalties, the beginnings of the state vs federal clash, and also because “the very idea of a robust Continental Army was generally regarded as an American version of the British Army.” This mistrust promoted word-of-mouth praise of Minutemen accomplishments. The press happily went along and reinforced this. Indeed, I was a bit shocked to discover how controlled and complicit the press was in furthering “the Cause.” While they prominently reported unfavorable news about Howe and the British, they kept silent on Washington’s dramatic setbacks. “Most of the population remained ignorant that the Continental Army had suffered any kind of defeat at all … American newspapers did not report it.” Very interesting considering that “freedom of the press” would ultimately be such a cornerstone of our constitution. Overall, Ellis kept me thinking and rethinking a period which I have read so much about. He peppers his arguments with erudite allusions to Aquinas, Thebes, Tolstoy, the Peloponnesian Wars, and such comparisons as Howe to Hannibal and John Adams to Cicero. I highly recommend Revolutionary Summer! A stirring read with so much information for such a short book (only 185 pages). Those who don’t normally read historical non-fiction will be quickly drawn in, and history buffs will find several new aspects to consider. Finally, I also highly recommend Ellis’s book Founding Brothers: The Revolutionary Generation, which won the Pulitzer Prize. Top Ten Tuesday is a weekly book blogger’s meme organized by The Broke and The Bookish. 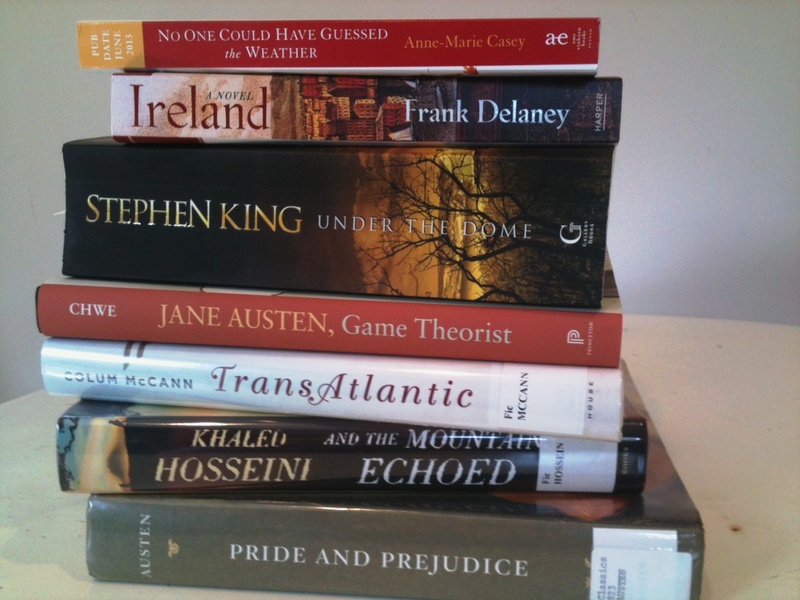 This week this focus is the Top Ten Books in the To Be Read pile. I just got my hands on this book which has garnered wonderful reviews. I really loved Let the Great World Spin, McCann’s ode to the Twin Towers. I’ve already started this novel in stories about an expat Brit who find herself transferred to hip East Village New York with her husband. So far seeming a breezy summer read. I am completely fascinated just by the notion that Jane Austen was a shrewd, pioneer in Game Theory Economics—well, in the strategy because it didn’t then exist per se as a discipline. I have wanted to read this epic book for ages! I have become a fan of Irish author and broadcaster Delaney via his twitter feed. I just bought his book to take along on my trip to West Cork in July. I am about halfway through this book, which I am reading as part of the #DomeAlong group read. If you are interested you can still join us in the readalong. Hearing lots of great things about the latest from Hosseini. I hate being the last to read a book, so must get cracking. I read an online excerpt from this delightful debut novel, which seems like a cosy, upbeat read. I just need to dash out and purchase a copy. Shakespeare, suspense, historical flashback—this book sounds so tempting. I am hoping it will be right up there with Possession. Not quite in the TBR pile, as I need to procure. Even before the whole Snowden/NSA scandal broke, this book is by former CIA operative had been getting lots of buzz for it’s realistic look at our espionage relations with Russia. Still need to pick up a copy via dead drop. I’m reading this for another take on one of my all-time favorite books, as part of the Pride and Prejudice Bicentenary Challenge and year–long celebration. Argh! I am totally hooked on this book … but stopped right in my tracks owing to the fact that I don’t actually have a copy in hand. Oops! I’m trailing the pack in the Under the Dome readalong, aka the #DomeAlong. I’ve gotten to the end of the free digital preview, which is page 138 on my iPad. Although, turns out that is only, er, page 82 of the actual 1,072 page printed book. I have been top of the list for Under the Dome at the library for three weeks. They had two copies, which seem to have also disappeared “under the dome.” After prolonged searching, the library has now told me they must order the book. Now, I am left hanging all weekend until Under the Dome arrives. If you’re thinking of reading Under the Dome, why not join us?! This book is addictive! The readalong runs through July 27th—click here to sign up!